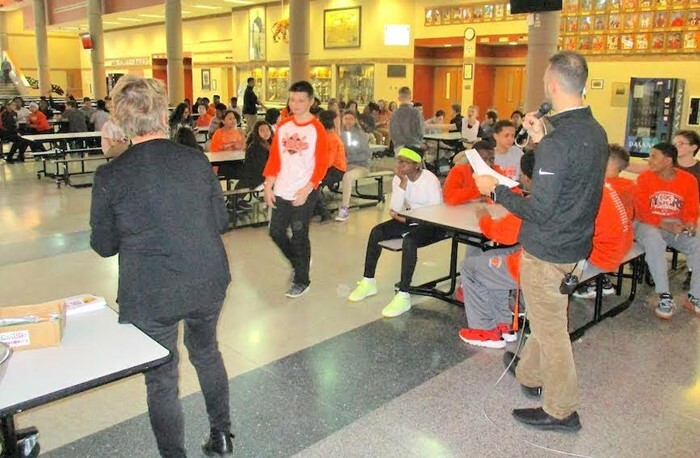 Eric Butler, assistant principal for the seventh grade, introduces Mansfield Middle School honor roll students individually during a reception Friday afternoon as counselor Kathi Gorbet, left, offers congratulations and awards Tyger key chains. Guidance counselor Kathi Gorbet knows firsthand that Mansfield Middle School students do indeed think good grades are cool. For two years Gorbet has been the key organizer of quarterly receptions for seventh- and eighth-graders who earned all A’s or A’s and B’s. Friday’s recognition program in the commons was her last. Gorbet will retire in June after a 36-year career in education, two as a teacher and 34 as a counselor. This is her sixth year at the middle school. “My first two years here we did not do anything for the kids on the honor roll,” she said. “Then (teacher) Diane Barrios had two years during which she celebrated them with a breakfast. When Diane changed jobs I took on the role of supporting the students with our honor roll receptions. It’s been great. Teacher and administration support has been very helpful. After the end of each grading period, Gorbet arranged a brief afternoon program during which students received colorful Tyger honor roll key chains and enjoyed refreshments that ranged from cake and punch to doughnuts and hot chocolate to an ice cream sundae bar. Students got excited about the recognition. Jessica Shaffner, assistant principal for eighth grade, and Eric Butler, assistant principal for seventh grade, helped Gorbet at the receptions this year, as did other teachers and staff. Students applauded and cheered as the names of their peers were announced. Gorbet hopes the recognition receptions will continue next year, but declining support from some local businesses may be an obstacle. The principal’s fund paid for the Tyger key chains, but Gorbet had counted on regular donors for money to buy the cake, punch, doughnuts, ice cream and other refreshments. One business cut its donation from $100 to $25; another ended its support. Gorbet contributed her own money to help make up the difference this year. Eighty-four students were recognized in January, 89 on Friday.